When you become a parent it's one of the best feeling in the world, you have just brought life into the world or watched the mother of your child go through a tough time to give you a little bundle of joy or maybe you are adopting etc... but no matter how you become a parent, it feels amazing and when you do become a parent you are always looking for some tips and tricks to help make things easier like "should I make bottles up in advance?" "What are the best mother and toddler groups? "; stuff like that, but sometimes you get given advice that you DON'T want and it can be daunting hearing it over and over again or having the same person pipe up and give you their two cents worth. 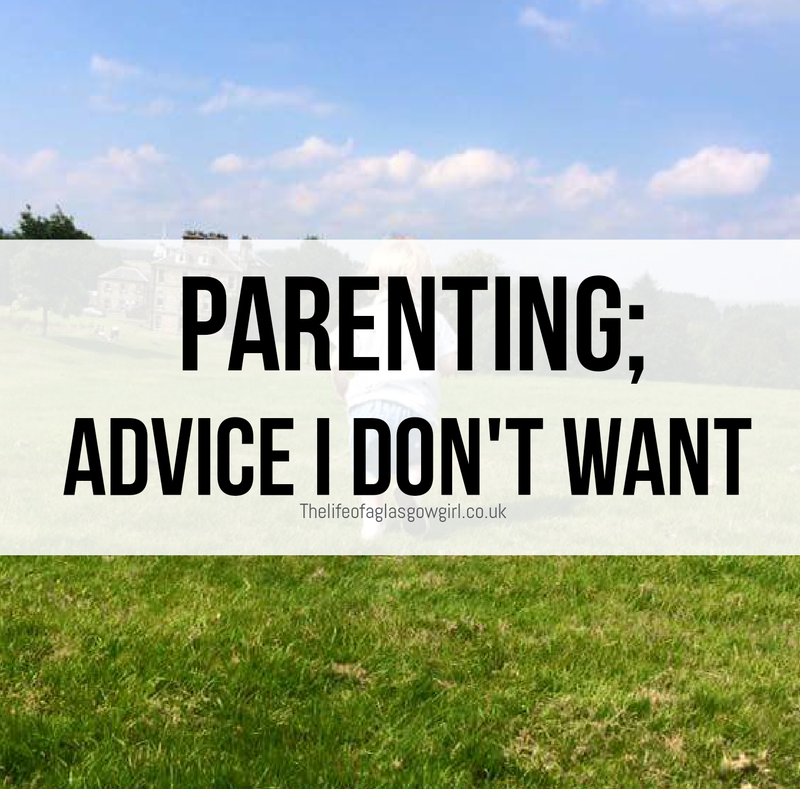 That is what today's post is all about, the advice you don't want as a parent. Now, I'm not saying that I hate people giving me advice, in fact I enjoy it sometimes because I do get given some tips that help in every day life and I am one of those people who likes to give my friends advice on a situation if I have been through it myself, like a baby having a clogged nose or having a bad cough, I'll recommend some products that can help out or some ways to help the little one sleep better; but even I know when to give it a rest. Bombarding someone with your opinion and what YOU think that they should do isn't helpful and to be honest, it puts me off ever asking them anything again. A lot of the time I was given advice from strangers, people who didn't even know me but stopped me to admire my son which always feels good. They would tell me how beautiful his are are and then in the same breath tell me ways to get rid of the milk spots at his mouth or how to avoid getting sick, now I know they are being nice and trying to help but quite frankly, If I don't know you and you are a complete stranger to me and stop me in the street to tell me what you think I should be doing about the way my sons hair sits or what pram is better than the one I have that I should by, I will want to kick you in the shins until you bleed (ok that's a bit extreme but I just have no time for the snooty women/men who think they know what is better for MY son when I didn't even ask....) It's just a very unnecessary thing to be doing in my opinion. I don't mind if it comes from a place of love, an old woman once stopped me to tell me how cute Leon was and we got talking about her grandchildren as well, she asked how old he was and I told her, she explained that when her grandchildren were about that age they would start getting more colds so suggested that I put vix (Vapor rub) on Leon's bibs for going to sleep to keep his airways open, I already knew this but she was so lovely and I thanked her for her advice, She was so sweet about it and didn't push anything onto me. But the people who push it onto you really get on my wick! I just cannot stand it, what's worse is when you try to be polite and the keep pushing for you to say you will try out what ever they have told you. "Oh, hes 2? Then why do you have him in a pram? shouldn't he be walking everywhere, it will help him walk better." To Leon "Oh you are a spoiled baby aren't you? Very spoiled" In a condescending tone. "You do know he has a sore eye don't you? you should really get that checked out"
"There is a much better pram you can get, it's bigger and has a car seat with it, would look better than that one"
"Breastfeeding isn't always the best"
"No! don't buy those jars of food, home cooked is better." "You should really sleep when baby sleeps, it's healthier"
So there you have it, some of the most annoying thing's I have been told by complete strangers. No wonder I hate it. What is some of the worst things anyone has said to you when trying to give advice? Ha! People and their unwanted advice I'm sure they are just trying to be helpful but really they should just keep zip! I hate these sort of advice too. Everyone becomes an expert when it comes to parenting. I don't want children of my own, and this is one of the reasons why! Everyone has to have an opinion, and it usually comes from old wives' tails like 'Ooh your bump is more to the left, he'll be born on a thursday! Make sure to rinse his hair twice, Thursday babies get cradlecap!'. As you said, it's often caring, but I imagine it's so stressful for new parents to try and find the things that will really help their baby. Everyone is entitled to their own opinion but they should always respect how mothers should raise their child. Just do you and not let anyone tell you what you should do.